I feel cheated. I hate these wishy-washy anti-climactic Kay endings, and the wishy-washy over-virtuous flat characters, but that was not the only thing that disappointed me here. I must say that although I loved most of the first three quarters, I hated the ending. The book is supposedly based on the fall of the Northern Song Dynasty in China, and a lot of the background does indeed portray this. Sure, there was a Chinese general who underwent a fate like this, but since Kay changed and embroidered upon so much of the detail anyway, couldn't he just as well have changed history to make the end more satisfying? ....or written a parallel history, a scenario of "what if?" If you're going to make some famous characters your main characters, and you're going to diverge from what is known about them, why then not just as well, re-write a parallel history in a more pleasing, "what-if" format? Like for instance, what if a character chose not to follow orders at a certain point in time? How could that have changed history? (Since the author portrayed aspects of their personal lives differently, in any case). Anyhow, I think that the actual Chinese legends and history associated with the birth and end of Yue Fei, are much more interesting than Kay's rendition of them. 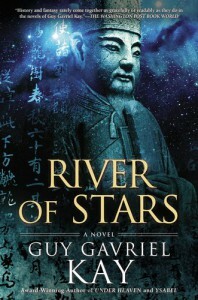 Also, the technological and infrastructural developments of the Southern Song Dynasty and the establishment of the Ming dynasty would have made a cool second half to this novel which was all too rambling for what it covers. In fact, if you read up on the period, you will see that many upper-class women were pretty well-educated at the time, so as to better run their households, since they were in charge of the household and often mostly of the household finances too. Nothing of this is reflected in the novel, and the fact that Lin Shan can read and write is presented as something unusual, as "unfitting" for a woman. Sure, Confucianism was repressive towards women, but not to the point that upper-class women were not allowed an education. 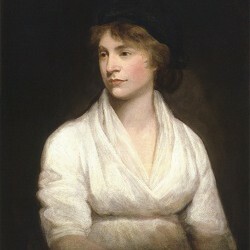 Female education was still subordinate to male education and women were subordinate to men (of course! ), but Kay's women are like totally flat paper-cut-outs, like objects rather than people. Never does Kay successfully manage to see the world through a woman's eyes; we always just get a male chauvinist view of things. Also, on the Northern Steppes women were not merely helpless sexual chattels. They lived a hard life and had to run the household when their menfolk were away. Some of these women even took on military roles. So, not quite the Gor-like view that Kay paints of women being literally mindless animals. I've been musing about why Kay's apparent sexism seems to grate on me so, and I've realized that a lot of it might have to do with the fact that I've recently been reading a lot of the work of author China Mièville, a male author who manages to present a remarkably non-sexist view of the world in comparison. Another niggle (not all that important, but really irritating), are all the banal platitudes, for instance: "It was an important day. Some days are", and the foreshadowings that never truly materialize, all the hints about legends in the making and so on. Despite what Kay says, I think she is exquisite! 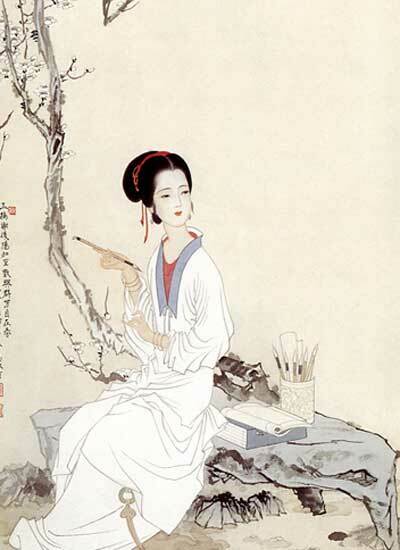 ;) ..and quite contrary to the image Kay creates, Li Qingzhao's mother was a poetess too. The 'real' Li Qingzhao actually loved her husband very much, and by all accounts they had a very happy marriage, sharing many interests. After the fall of the Northern Song dynasty, while they were fleeing the Tartar invasion, he died of typhoid fever. Li Qingzhao mourned her husband's passing unto her death. She also greatly mourned the world that existed before the Tartar invasion. It is very difficult to translate the artistry of Chinese poetry into English, since a large part of the artistry lies in how the Chinese characters are rendered and 'fit in' with one another colloquially and idiomatically-- so attempts to translate to English loses a lot of the essence of what is admired in most of these poems; a bit like how it would be hard to translate things like alliteration and assonance and 'puns' from English into another language. Nevertheless, the sadness in her later poetry shines through the translation process. A heart full of remorse. Urged by the west wind. LATER: I've been trying out some of the standard fantasy fare out there in the past day or so, which has greatly increased my appreciation of this novel. It might not be great literature (I've been reading the likes of Proust, Mann and Nabokov, previously, so the bar is high), but I do reckon that with the exception of really original writers like Mièville and a few others, at least this is pretty good fare for the fantasy genre. True, the novel does have a badass character who can kill 7 men in a few seconds with a bow, but except for that, at least this is something refreshing compared to "standard" fantasy fare. My other gripes still apply though. But I do love the setting of the novel, and now that I've gained some distance, I feel more happy that I spent time reading this novel.